A quick, easy & flavorful dish! Just add your choice of vegetable or salad for a complete meal! A quick, easy & flavorful dish! Just add your choice of vegetable or salad for a complete meal! 2. Brown pork chops in oil. 3. While chops are browning, wash potatoes (leave skin on) and cut into bite-size chunks. 4. Remove chops from skillet. 5. Add soup, milk & dressing mix to skillet, mix well. 6. Add potatoes, stir to coat, then add pork chops. 8. 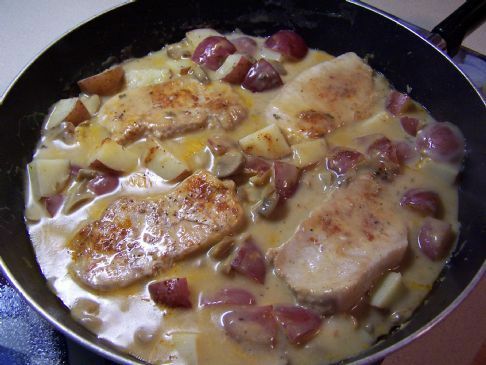 Reduce heat to med-low, cover and simmer for 15-20 minutes until chops are cooked and potatoes are tender. Recipe submitted by SparkPeople user FLUFFYWONKENOBE.